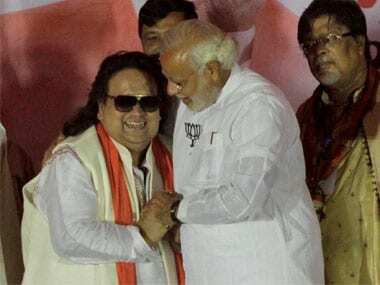 Bappi Lahiri sang a BJP-ized version of his bumper hit De De Pyaar De at the BJP rally in Serampore on Sunday night. But Narendra Modi had little pyaar to offer. In fact, far as Mamata Banerjee is concerned, Modi might have just done the unforgivable. It’s one thing to take a jab at Mamata the politician. But Mamata the painter is another matter. Actually, 1 crore, 80 lakhs, he quickly corrected himself. Even Mamata’s opponents rarely make comments about Mamata’s paintings. And art critics usually bite their tongues as well. Modi’s question hung over the muggy Serampore night like an unexploded grenade. He didn’t answer it but the crowd knew the answer. The generous buyer is allegedly Sudipta Sen, the Saradha kingpin, now behind bars. 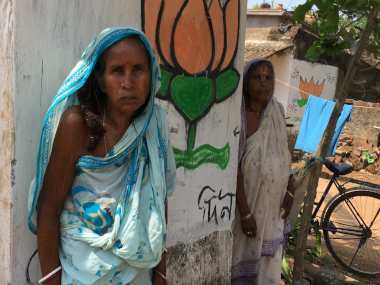 The BJP has decided Saradha is Mamata’s Achilles heel and has been hammering away at it. Modi brought it up at a rally in Siliguri earlier. But this time he really went after her. No more sweet talk about laddoos in both hands as he had done in Kolkata earlier. The gloves were well and truly off. Oozing faux concern for Mamata-ji, Modi went for the jugular. Saradha, he told the audience was another name for Saraswati. But in Bengal, it had become the worship of a Saradha chit fund. The jab obviously drew blood. Within an hour of the end of the rally, Trinamool’s Derek O’Brien had fired off a press release. Mamata has been referred to Modi “dangar mukh” (the face of riots) without naming him. Now he gets a new sobriquet from O'Brien. And Trinamool showed it could give as good as it got. Mamata’s paintings vs Modi’s wife. The 2014 election just upped the nastiness quotient several notches. Trinamool however did not answer Modi’s main rhetorical question. Who bought that painting for that astronomical sum? Mamata has been taking the Saradha challenge head-on. At a street-side rally in Kolkata on Saturday night, she accused her opponents of just chanting CBI, CBI, CBI like a parrot. What will the CBI do she scoffed. Were they able to even find Rabindranath Tagore’s Nobel medal when it was stolen from Bengal? The Trinamool’s Saradha defence is two-pronged. Saradha was set up before their time. She leads crowds in chants; what year Saradha was in operation before she came to power? 2008 – who was the chief minister then? 2009? 2010? The crowd roars back “Buddhadev” obligingly. Both however are shaky arguments. Just because Saradha started before her time does not mean it didn’t catch on like wildfire under her government. Nor does it mean that the Saradha bosses didn’t play up their proximity to Trinamool leaders to sell themselves to a gullible public once Writers Building changed hands. Hence, the Rs 1.8 crore-sized raw nerve. In February Modi had portrayed Mamata as more sinned against than sinning. He’d told the crowd that Bengal needed a friendly figure like him in Delhi who could work with Didi in Bengal. Even recently he'd talked about twinges of guilt for taking the Tata Nano factory to Gujarat from Bengal. Now much to the delight of the local BJP leaders he is attacking Mamata personally. And it’s not just about Saradha. “In 35 months you have done more damage to Bengal than the CPM did in 35 years,” he said. That is sure to have raised Mamata’s hackles since at every rally she rattles off all the things she’s done in 35 months that the CPM could not do in 34 years. “In 2 and half years we opened 8 universities. In 34 years CPM opened one,” she told the rally in Kolkata on Saturday. 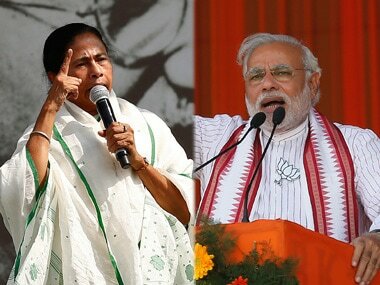 Modi accused Mamata of being what local leaders always accuse her of being – appeaser of “minorities” for votes. At the Serampore rally, the BJP’s Shakeel Ansari scoffed that Mamata puts on a niqab and does namaaz for that 31 percent minority vote after going to Kalighat temple in the morning. “You give stipends to one community and not another and you call yourself secular?” asked Chandan Mitra, the BJP’s Hooghly candidate. These allegations are not new. 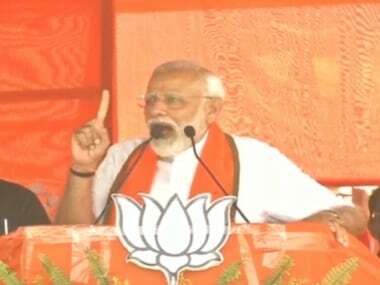 What was new on Sunday is Modi himself took up the refrain and went a step further accusing Mamata of having plunged Bengal into votebank politics. “If a Bihari comes here, you are upset. If an Oriya comes here you are upset. If a Marwari comes here you are upset. But if a Bangladeshi comes here, your face lights up,” he alleged. 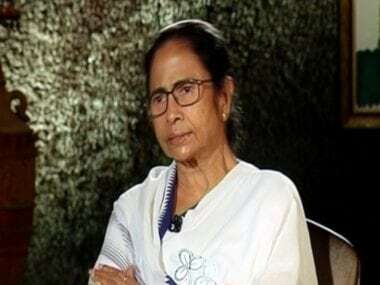 “After 16 May all Bangladeshis will have to pack their bags and go back.” Mamata has retorted angrily that she sees no distinctions like that and everyone lives in Bengal like brother and sister. Saradha. Development. Illegal immigration. Modi gave a raucous crowd of BJP supporters their paisa vasool. Other than the “danagar mukh” reference Mamata has trained her guns on BJP the party more than Modi the man. The BJP she tells crowds wants to divide Bengal. It is going around promising Gorkhaland. But by taking on Mamata-ji by name over and over again, Narendra Modi just opened a new front in the battle. And made it clear that he is not holding out for her support for the NDA or that he thinks he will not need it.